Patterned lounge trousers sustainably made from bamboo and organic cotton. The fabric is Oeko-Tex certified and made with azo-free dyes as well as feeling super soft against your skin. 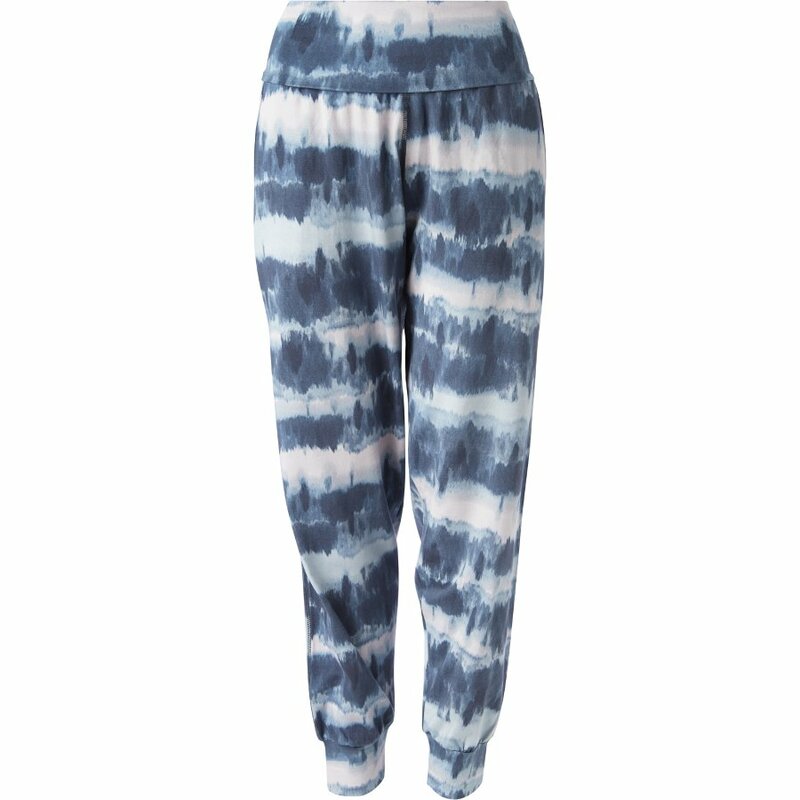 These harem style trousers feature a wide fold-over waistband, pockets and simple cuffs, they’re perfect for keeping you comfy on a lazy day, or for your weekly yoga class. Suitable for vegans. 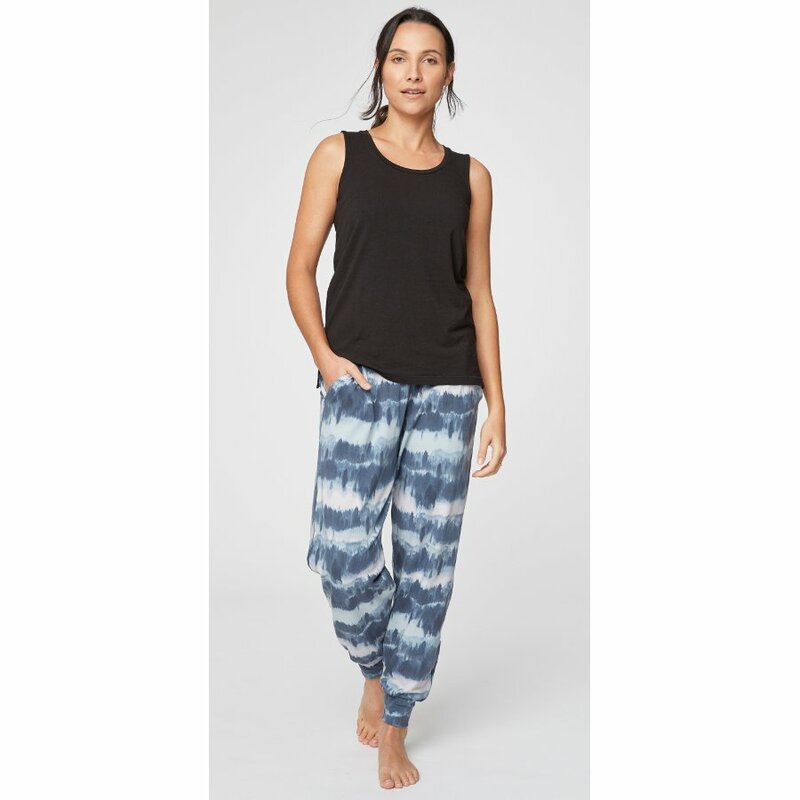 The Ingryd Harem pants are made with a blend of bamboo and organic cotton. Bamboo is an extremely sustainable material, growing incredibly fast and with minimal resources, and Thought uses a chemical closed loop method to produce bamboo fabric, which ensures no chemicals escape the process into the environment. The non-GM organic cotton used is certified by the Global Organic Textile Standard, and no harsh chemical pesticides or fertilisers are used to grow the cotton, which is much better for the soil and much safer for farmers. 67% viscose derived from bamboo, 28% GOTS certified organic cotton, 5% spandex jersey. 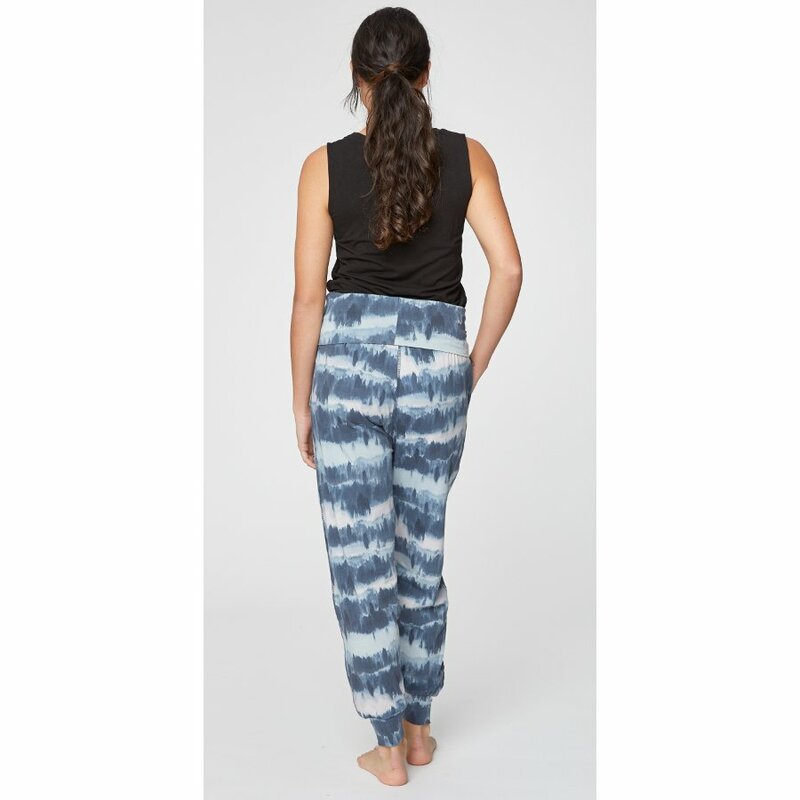 The Thought Ocean Blue Ingryd Harem Pants product ethics are indicated below. To learn more about these product ethics and to see related products, follow the links below. There are currently no questions to display about Thought Ocean Blue Ingryd Harem Pants. Thought (formerly Braintree Clothing) is a contemporary sustainable clothing brand. Drawing inspiration from nature, vintage and the world around us, their collections are diverse, inspiring and unique. Having crafted thoughtfully designed clothing for over twenty years, they are now one of the UK’s leading sustainable fashion brands. Their commitment to the environment is woven into every garment and their fabrics include organic cotton, bamboo, rayon, Tencel, responsibly sourced wool and recycled polyester. They work with some of the same factories they did when they first started and believe in growing business together. People and partners are important to them – they have a Code of Conduct and other policies that put them first. Everyone employed by Thought is treated with respect, paid a fair wage and free from any kind of discrimination – it really is a brand with a conscience.